Dr. Belo (inset) was said to be laughing while Katrina Halili (main photo) was being questioned at the Pasig court last Monday, April 26. The cross-examination of actress Katrina Halili and celebrity doctor Hayden Kho Jr. resumed last Monday, April 26 at the Pasig City Regional Trial Court Branch 159. Hayden is on trial for violating Republic Act 9262 or the Anti-Violence Against Women and Their Children Act, stemming from his secret recordings of his love trysts with the actress and their subsequent spread on the Internet. As in sessions past, Hayden's rumored girlfriend Vicki Belo was there to give him support. TENSE MOMENT IN COURT. What was supposed to be a procedural session, however, became tension-filled when Vicki was heard to be laughing in the middle of Katrina's testimony. This made Katrina's lawyer Atty. 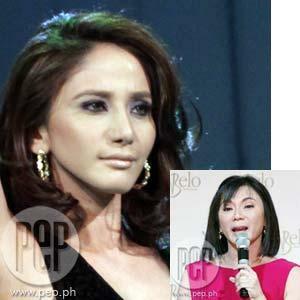 Raymund Palad shake his head and ask the judge to reprimand the beauty magnate. Vicki said in an interview with Startalk today, May 1, "Seryoso naman 'yong korte. I feel naman... may statement doon na medyo ha-ha!" Hayden backed up Vicki by saying, "Pag nakakarinig siya ng facts na supposedly facts na hindi naman totoo, e parang naiintindihan ko naman." As fate would have it, Katrina and Vicki found themselves riding the same elevator after the hearing. When asked if this experience of being near Katrina fazed her, Vicki said, "Alam mo, wala talaga akong feelings sa kanya. We were together for five years at akala ko magkaibigan kami. I don't feel anything. Wala talaga." Because of Vicki's visibility at the court sessions, she and Hayden have been asked if they were getting back together, to which both answered that they were no longer in a romantic relationship. "Masaya po kami sa kung ano man relasyon mayroon kami," Hayden said. "There is no need to state kung anong mayroon talaga, pero sa amin lang iyon." Vicki agreed by adding, "I really like the way it is. It's close and it is not romantic. That is, really more supportive. I have a wonderful friend." LAWYER FUMES WHILE KATRINA KEEPS HER COOL. In a separate interview, Atty. Palad aired his displeasure over Dr. Belo's alleged lack of decorum during his client's cross-examination. "Tawa siya nang tawa," Atty. Palad related, "to the point na halos humihiga na sa bench na nakataas na ang paa, e. Hindi naman siya parte ng proceeding at hindi kasama. Hinayaan siya ng court manood, pero mag-behave naman. Napaka-unprofessional naman, so I called the attention of the court to admonish Dr. Belo to make untoward reactions kasi kaharap niya si Ms. Halili." Katrina, on the other hand, kept her composure about the matter and instead seemed to accept whatever Vicki's reasons were for her light-hearted behavior. "Natural lang po iyon na maging reaction niya siguro," said Katrina, "so, dedma. Kanya-kanya po tayo ng... Kung iyon ang reaction niya, e wala akong magagawa. Ok lang. Ok lang actually na nandiyan sila [Hayden's supporters]. Dedma." But Atty. Palad continued to fume. "Actually, kabastusan iyon, e," he said. "Kahit na si Ms. Irene Kho nandiyan, e, wala kaming any action na untoward. Never. Professionalism sa husgado iyan, e."